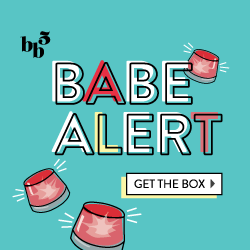 ← BuluBox ~ May Review + June Spoilers! Hi all! Hope you had a wonderful week, and ended up the month of May on a high note! I’m just catching up with opening and unpacking boxes, and so before I get some reviews up and sneak peeks/spoilers for June boxes, here’s a little Instagram Last Week/Weekend Wrap-up! On Thursday, a co-worker and I ventured to the Sprinkles Cupcake ATM… yes ATM, like you swipe your credit card and a cupcake is delivered from a motorized/electronic claw. It tasted just as good as their normal cupcakes and is such a cute and innovative idea. (For those curious about it- it’s located in New York City at 60th and Lex, and they offer about a dozen different flavors to choose from.. credit card only). Thursday also was sushi and wine night! To follow up my cupcake earlier in the day, we had Cupcake wine and ordered a delicious amount of raw sushi! My Too Faced beauty mini haul arrived and I was.. psyched! Yes, I was sad that the Melted Lipsticks I wanted were out of stock, but the Lip Injection Color Bombs (chubby pencils with lip plumper) definitely made up for it. I got two of them- one in Coral Pop and the other in Pump it up Pink! They go on smooth, the more you rub, the darker the color. Then, the tingle sets in.. then the light burn sets in.. and all of a sudden, your lips are plumped up! The tingle lessens the more you use it + goes away after a few minutes and you’re left with pretty colored lips! Friday was a very black and white day… paired with a pop of hot pink lipstick! I am loving K’s huge mirror and definitely going to be taking advantage of it for my ‘outfit of the day’ pictures. Also on Friday, after work, we went to this new place called Mac n’ Melts, which basically serves 13897395 different types of mac n’ cheese and grilled sandwiches! We got a sampler which includes 6 different macs + tater tots and a lemonade each. Saturday- I’ve self declared myself the ultimate brunch chef… K always has an odd array of food in his house and I’m finding ways to make unique breakfasts when I stay over (instead of plain scrambled eggs). 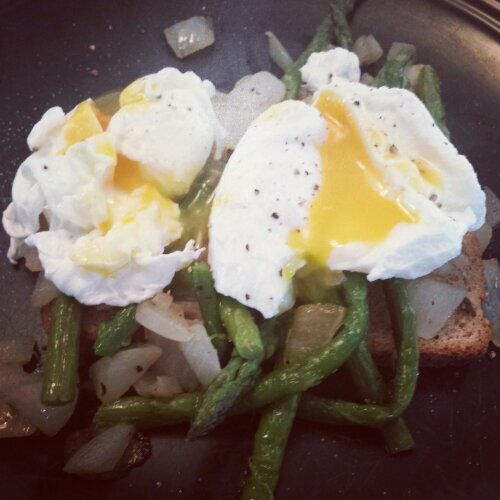 This picture is of toast with sautéed onions and asparagus, topped with poached eggs! Finally, I spent Sunday pampering myself a bit, then enjoying a BBQ with friends! I had a hard time deciding if I wanted to rock bold bright nails, something neutral or sweet pastels… clearly, I went pastel. Here, I’m wearing Essie Bikini So Teeny + an accent nail color of Barbados Blue! How was your weekend? Any big plans for this week? I love Sushi! I think I may get some tonight now!